NexttoTech.com is a blog about making technology work for you in present & upcoming technology related news in future. The Acid Eye 20000 mAh power bank is one of the best power banks that you can actually buy now. It comes with a huge capacity of 20000mAh which makes it an incredibly big power bank than most of the traditional ones that are available online. And with such a big capacity, you can charge many devices at once with longer battery backups and get incredible performances. Most of the power banks with such a huge capacity don’t have intuitive features like the Acid eye 20000mAh power bank, which also makes it much more reliable for users. So what’s in the Acid Eye 20000 mah Power Bank that makes it one of the best power sources available. One of the key selling and buying points of this power bank is that it comes with an incredible capacity that you won't find anywhere else. The huge 20000mAh capacity in such a slim body makes it much more useful. Inside the bank, there are many lithium-ion cells which are altogether connected with larger capacities. The power output is provided via the USB ports in it sideways, which can be used for charging up smartphones. The huge capacity of the Acid eye power bank makes it much more useful in providing longer charging, efficient performance and an excellent traveler’s choice. With such a big 20000mAh capacity you can charge your smartphones 6-7 times and still be left with enough power for other uses. 2. Incredibly light and slim with aggressive looks. The Acid Eye 20000 mah Power Bank has a very light body which makes it one of the best power banks for traveling. 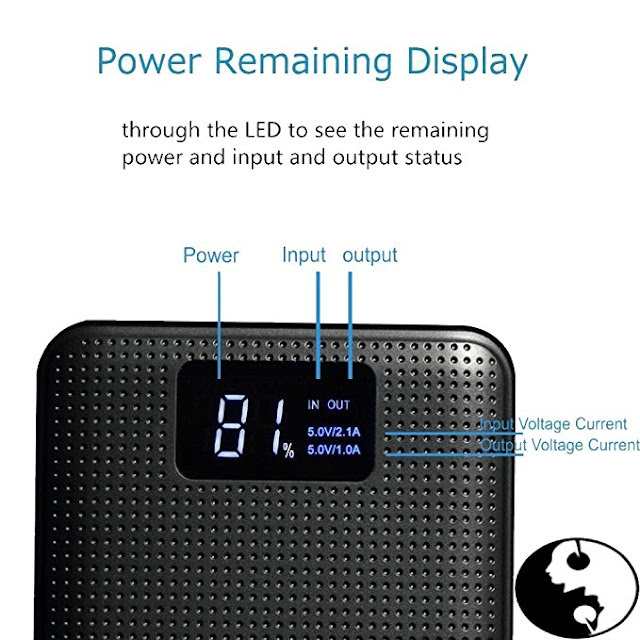 Most of the power banks with such huge capacities don’t come in such a light pack, as with more capacities, the weight of the power bank increases. Much of the 15000mAh, 20000mAh power banks are much heavier, which gets problematic even when you want to carry it just alone in your pocket or backpack. Also, most power banks are not at all slim. As with more capacity, the number of cells has to be included in it, which makes it less slim. Most of the users out there looking for a slim battery pack with better capacity than the normal range, which they are unable to find. 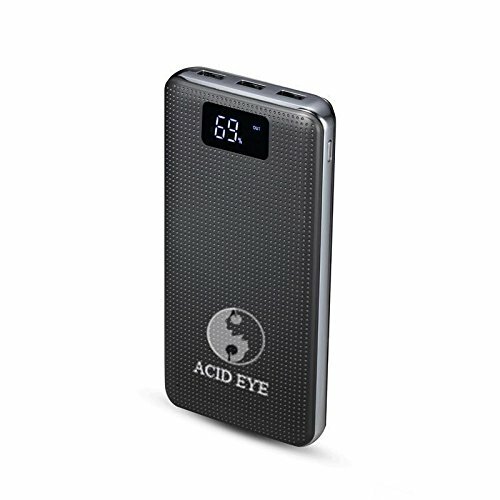 But Happily, the Acid Eye power bank comes in a much slim design and very light weighted which makes it ideal for everyday use. Also, you can take it anywhere with you without worrying about increased weight and you can right away slip it into your pocket. The Acid Eye Power bank also looks incredible, it’s the best-looking power bank you can find right now. The ergonomic hard matte finish makes it much smooth and comfortable when in hand. Also, the power output ports are on the side of the bank, which doesn’t the degrade the looks at all. As with many power banks, The Acid eye power bank comes in a much alike smartphone type looks, with a matte finish, stellar shiny metallic looks on the sides. That’s quite of a price to pay, which you don’t have to at all, as it comes way cheap that other power banks with not so beautiful looks. The Acid eye 20000mAh power bank comes with 3 USB ports, thus making it more useful when it comes to multiple device charging and that doesn’t just include mobiles and smartphones. It has a traditional power output voltage which means, you can charge up a lot of devices that come with a USB device port, the only thing you need is a USB cable for charging. The Acid eye power bank is not just limited to charging, you can even run devices directly using USB ports from the power bank, and up to 3 devices simultaneously. And when it comes to charging mobile phones as its main purpose, the acid eye power bank performs incredibly good. It can charge any smartphone and not just a single time, but many times as you want. Since it comes with a huge capacity of 20000mAh, you can charge smartphones with 3000mAh battery up to 6-7 times, upon a single charge on the battery pack. Also, you can charge the power bank easily with any compatible charger much easily. The Acid eye power bank can be used for fast charging many smartphones as it comes with an increased power output up to 5V at 2A or 2.1A. Most smartphones have fast charging enabled in them, but using a normal 4.5 V charger is not that efficient as it takes up more time for charging. Not with the acid eye power bank as it can provide 5V 2A power output which is compatible with many almost many smartphones with fast charging, thus saving time. Also, it is available via all the USB output ports in the power bank itself, so now you can also fast charge three devices all at a time. Most of the power banks come with a LED indicator of how much power is left in the battery packs, as its much important to know, as you might go out of power even in the power bank itself. But The Acid Eye 20000 mah Power Bank comes with a digital power meter that shows you how much power is left on the pack. Also, running a digital meter on the power bank consumes much much less energy as compared to LED indicators on other power banks, thus saving much power which would have gone wasted without any fruitful use. Thus, the acid eye power bank is much more efficient in use and in performance when it comes to handling battery power. Buying power banks is not easy, and you can get easily tangled but now you won't. As the Acid Eye 20000mAh power bank has the latest technologies in it which no other banks come with. And this power bank is your ideal choice with better efficiency and double the power output compared to other ones.